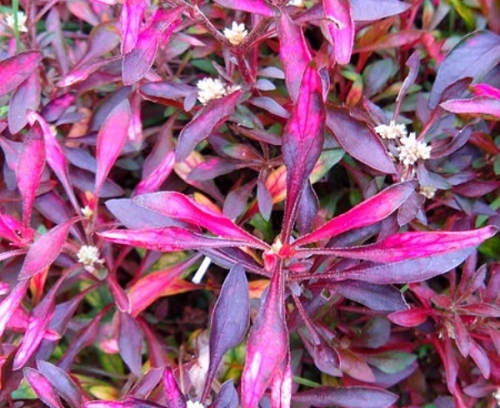 A vibrant red foliage which makes it an excellent contrast plant. A traditional herb from India and Sri Lanka. The vitamin and mineral-rich leaves have been an essential ingredient in kola kanda, made with boiled rice, coconut and several other leafy vegetables. Can be used as an aquarium plant. The species has diuretic, tonic and cooling properties. Juice of this plant, deemed beneficial to eyes, is an ingredient in medicinal hair oils. Common names: Dwarf Copperleaf; Mukunuwenna; Red Carpet Weed; Joyweed.